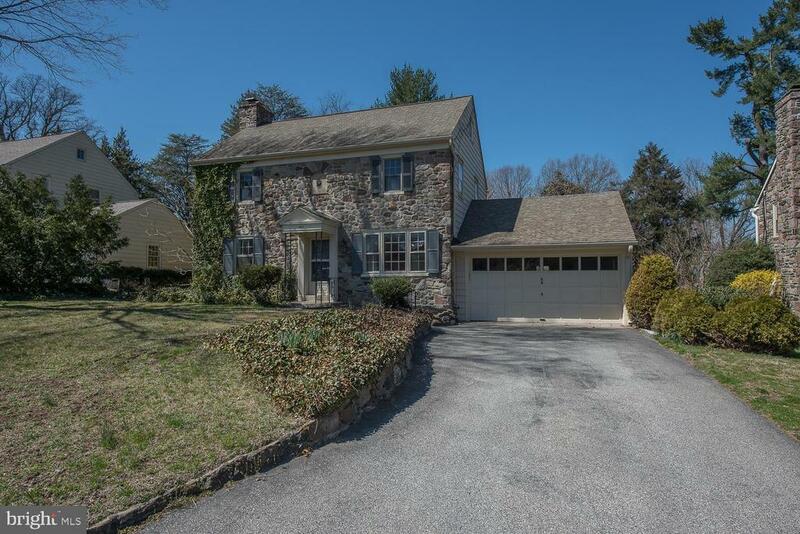 Classic stone colonial in popular and convenient Shortridge neighborhood. Entrance Hall leading to large and sun drenched Living Room with wood burning fireplace, panoramic view of back yard and door to flagstone patio. Updated Kitchen with granite counter tops, stainless steel appliances, breakfast bar, skylight over desk area, closet and access to over sized one car Garage and adjacent Dining Area. Powder Room completes this level. Second floor includes Master Bedroom with full Bath, two additional spacious Bedrooms and Hall Bath. Walk up access to floored Attic providing great storage and possibilities for expansion. Full and dry Basement suitable to be finished for additional living space. Freshly painted, new HVAC (heating and air conditioning systems) and hot water heater with alarm as of 11/2018. Deep windowsills, hardwood floors and traditional woodwork throughout add to the charm of this home. All this and a short walk to Shortridge Memorial Park for sledding, dog walking and nature hikes as well as commuter train, shopping center, the town of Narberth and local elementary school all less than a mile away. Exclusions: Pot rack above Kitchen window and Dining Room chandelier. Inclusions: Refrigerator, washer and dryer all in "as is" condition.